I just love veggie burgers! The store bought varieties are loaded with yucky stuff as you can read about in my Boca Burgers Exposed post. 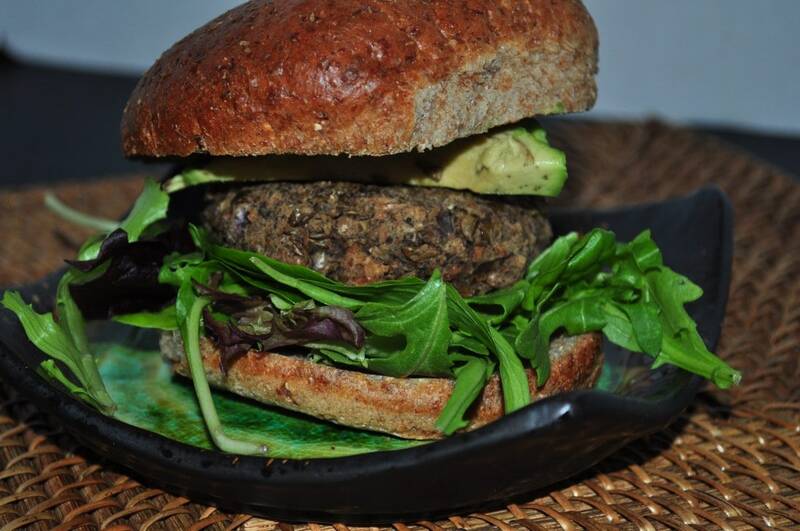 I am always looking for new ideas for veggie burgers and this recipe was inspired by a photo I saw on Pinterest. I told my husband about it and he came up with his own version so here it is. It’s great having a man that can cook. He doesn’t do it much anymore, but when he does, it is always good. 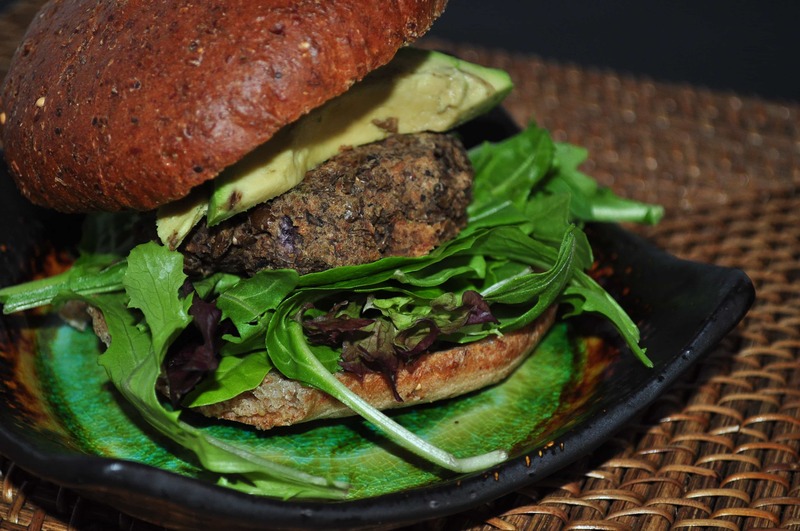 He actually came up with my Black Bean Veggie Burger recipe as well. These burgers are delicious! They would go really well with my White Bean Pesto spread on top. Yum! In a pot, boil the lentils in water until soft. Drain any left over water or let it boil off once soft. In a pan add the lentils, oil and onion and let cook for about five minutes covered on medium heat. Add mushrooms, garlic powder, sage, and salt. Mix the ingredients and cover for about another 5 minutes. Remove from heat and put in a bowl and let it cool off. Once cool, add bread crumbs and flax egg and stir. Once mixed, use a quarter cup measuring cup to spoon little burgers onto an oiled baking pan. You can serve these immediately or refrigerate or even freeze for later. We got about 8 burgers. I was super stoked to discover that Food for Life makes sprouted wheat hamburger buns. That is what I used in the picture. Sounds delish! I am gluten free and also allergic to eggs so breadcrumbs pose a problem for me. Do you think I could sub gf oats for the breadcrumbs? I made the burgers with gf oats ( ground them alittle). They came out great. Next time I might try adding a little buckwheat or quinoa instead. Thanks for the recipe. Awesome! Quinoa sounds like a great addition! I have Ezekial muffins,how could I make bread crumbs from those? We have been saving scraps of bread in our freezer. My daughter like the crusts cut off. :) So all I did was pull out the scraps, bake them in the oven at 500 for about 5-10 minutes. Be careful not to burn them. Then I threw them in a food processor and pulsed into bread crumbs. Thank you for the bread crumb recipe. I used the muffins in the oven and they turned out fine. I made my first batch of these and I will be making them again. I did boil the lentils with some bay leaves and garm masala. I also added three cloves of fresh garlic. I like my food a little spicy. I read you were from Boston at one point and don't make your food too spicy (plus you have small children), so I went ahead and added a little extra. The lentils all by themselves were GREAT! The patties came out well and they held their shape. This will be my lunch tomorrow with some fresh steamed broccoli. Thank you! Great! I am so glad you liked them! Your additions sound fantastic as well. My husband loves spicy food so he would most likely love your version! What is a flex egg? You can use flax as an egg replacer. Since we are vegan, we make a flax egg. 1 T flax meal + 3 T warm water. Whisk together and throw in the fridge for a minute. The texture will become gummy like an egg. Works great. If you want to use a real egg, feel free to. What temp do you bake the burgers? Thanks! I made the burgers and they were great but a little dry...any suggestions? I made these and they totally crumbled. But I used paleo bread for the breadcrumbs. That's the only difference. So they now will be used as a scramble ! Great flavors !! Sorry that happened. Maybe the lack of gluten? I'm not sure. I am happy they taste good and can still be used! I made these for supper last night with my homemade buns. They are amazing!! I think even a die hard carnivore would love these. I'm going to do a quick finish on the BBQ next time with a little sauce. yummmm. Ok I really want to make these but I don't like mushrooms. Do you know of anything I could sub in for them? I'm not sure what to use in it's place. You can try omitting and adding more lentils? Will brown lentils work in place of green lentils? They could, but the taste will be different. These were great! We couldn't get our kids to eat it, because of the way they looked, but my husband and I loved the flavor and the texture. They are way better than any fake frozen burger. And we found that they stayed together better if we cooked them longer...it took almost 30 minutes in the oven, but that batch stayed together and the ones that were only in for 20 minutes fell apart. These were really good. I am lucky to have a family who happily eats whatever is prepared but they truly enjoyed these burgers, (everyone had seconds)! My husband actually thought they were meat. Thank you Melissa for all your amazing recipes! You are so welcome Carrie! Glad you liked them! I have just recently found your blog..., not sure how I missed it?.... But I have saved about 30 recipes today!! While I don't have a specific recipe, maybe you or your hubby could come up with something. We have a local Nola cafe that makes a mushroom burger. It isn't in patty form like most but it's mainly just sliced mushrooms. The put the sliced mushrooms on their grill along with onions, slivers of carrots, shredded red cabbage and they grill it all up. They place a good amt on the bun topped with a slice of white cheese. Then they add sprouts and sliced avocado. It is one of our very favorite things to get on the occasional times we go out at lunch. I am making my list of things to get from the store tomorrow to make some no bake snack balls! Perfect snack when outside away from home!